I got it into my head that a blog wasn’t good enough – smallness exercises should be a podcast. I would record it in the field, with my own small voice. Simple enough. Except I didn’t have a microphone to record into. I researched, and found one I wanted online. It was small, of course, and not expensive. But I was living out of a suitcase, bouncing between counties. I didn’t have any extra cash or any extra luggage space, and didn’t know what address to have it sent to. My small idea got too big and complicated for me. It exceeded the amount of time and energy I felt willing to give it, given all the other projects I was plugging away at, and the level of technical incompetence I would have to overcome. I didn't know which roadblock to chip away at first, flitted between several, and ended up making progress on none of them at all. And that’s how I managed to go nearly a full year later with nothing to show for myself. Thankfully, and surprisingly, I have found my idea saved by a pencil. A simple, 2B pencil. The kind you can buy with loose change in any supermarket or art supply shop. The kind schoolchildren have gripped earnestly for generations, and that Roald Dahl insisted on writing with (six perfectly sharpened for each session) well into his old age. I’ve known for a while now, that when an idea gets tangled, and I’m typing away and not getting anywhere, the best thing to do is to shut the computer, and go work on paper. Longhand. Old school. A ballpoint pen and spiral bound notebook were my go-to for a long time, but in trying to find my way back to my smallness exercises, I grabbed a pencil from my bag instead, and it was entirely satisfying, and effective, and felt like an even more organic and immediate way to expel ideas than ink. 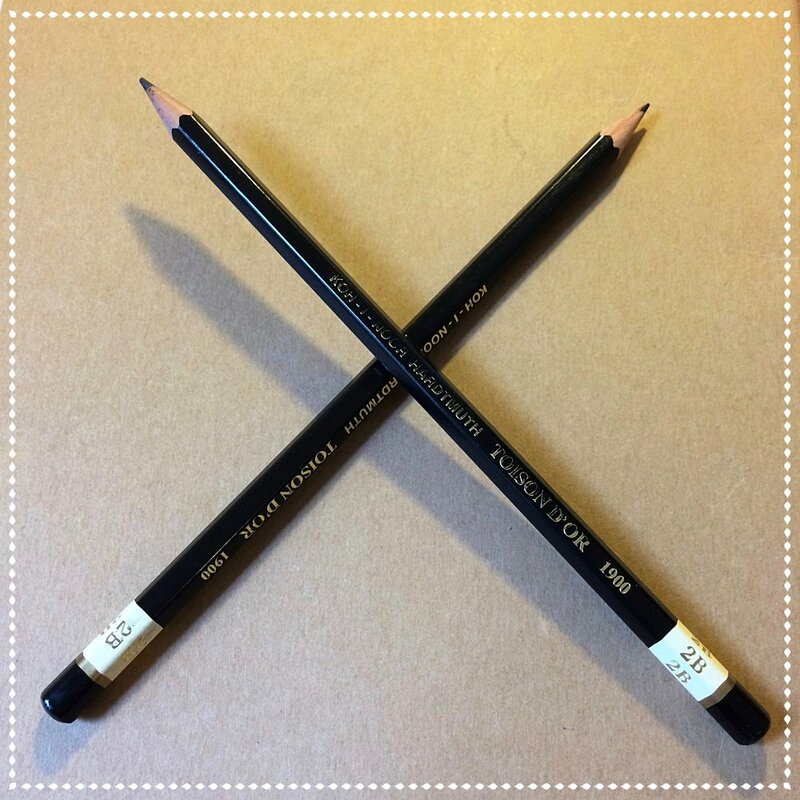 The pencil is a perfect symbol of all the virtues I want to expand upon in the blog. It’s friendly, humble, egalitarian. It can flip from pragmatic note taking tool to fanciful artistic device in a second. It forgives all manner of folly, and grants many a discrete do-over, thus minimizing intellectual performance-anxiety. It’s economical, long-lasting, and is unflappably ready to brave any manner of weather. It never needs a charge, can survive a fall into toilet or puddle, and can’t be hacked or mined by Russians, Facebook, or Cylons. And it is sensually satisfying: the smell of the wood, graphite, and rubber; the rasp as its tip grinds across a page; the ease with which straight or swirly marks are set down. It slips lightly into a breast pocket, and looks handsome tucked behind an ear. It is a remarkable implement, and one a lot of us take totally for granted. We didn’t always though. The pencil is actually a fairly recent technology, that evolved slowly across The Enlightenment. And it used to be a serious business. On a pilgrimage to the Lake District in 2014, I discovered that the village I was staying in, Keswick, was the home of the first pencil, and was the current home to the Derwent Pencil Museum. Did I pay actual money to go into a pencil museum? F*** yeah I did! I had a great time. One of the things I learned at the museum was that the graphite mined around Keswick was so precious at one point, it was considered more valuable than gold, and had to be protected by armed guard. The smuggling of graphite is, according to the museum, where the term ‘black market’ came from. How rad is that? My German pencil sharpener. Made by a company whose actual name is 'KUM'. The more elements you invite into a project, the more excuses you can invent not to see it to completion. If you’re inclined to procrastinate, or get distracted, or lose faith in your vision, you need to keep layers of complication to a minimum, and barrel through before you lose your focus, enthusiasm, and/or nerve. It’s important not to let a task get any bigger than your personality and personal bandwidth can bear. Just as done is better than perfect, modest is better than overwhelming. You can always expand down the line. Pencils are the way forward. Take a thought you would like to think on. Something either at the front of your thoughts, or flitting annoyingly just at the fringe. Go for a walk, or sit down, or maybe one and then the other. Bring nothing but a pencil, and something to write on. Okay, maybe a sharpener and an eraser, for back up, but tucked away in your pocket. Fondle the pencil. Tap it against your shin bones or teeth. Scratch it against your scalp. Doodle. Or just start writing. As much as you can hope to really understand anything in this life, the pencil is the simplest and shortest route towards that goal. But don’t let yourself get hung up worrying whether your exercise will lead to something beautiful and dangerous. Just sharpen up, set forth, and let your small scribbles surprise you. Elephant eraser makes me happy. Remember, you can always erase! So there's zero pressure.